"It''s well written and provides a completely up-to-date introduction to the use of BPMN. Moreover, it provides a nice review of some of the latest software techniques available in BPMS tools, with a special emphasis on process mining. I would certainly recommend it to any process practitioners that wanted an up-to-date refresher." Paul Harmon, Executive Editor, BPTrends.com, USA "I have no doubts that this book will shape the toolset, and hopefully even more the mindset, of the current and future generations of BPM professionals. This publication has the potential to become a significant catalyst for future BPM success by establishing a common sense for the fundamentals of BPM upon which it can be further developed and tailored to individual circumstances." Prof. Michael Rosemann, Queensland University of Technology, Australia [from the Foreword] "The book provides an excellent introduction to the whole spectrum of Business process Management (BPM). The authors manage to combine computer science and management perspectives in a superb manner, while remaining focused on the ultimate goal: realizing process performance improvements using BPM." Prof. Wil van der Aalst, Eindhoven University of Technology, The Netherlands "The authors provide an excellent description of essential as well as advanced concepts and methods for enabling comprehensive BPM lifecycle support. This book not only covers the identification, modeling, analysis and automation of business processes, but also additionally closes the cycle from process execution back to process optimization and redesign. A very unique and useful textbook for those who want to become a BPM professional!" Prof. J. Leon Zhao, City University of Hong Kong, China "Business Process Management educators and students have long yearned for a true textbook, covering the breadth of BPM, its application across business and IT and also providing examples, case studies and exercises. This book has finally arrived and it will leave its mark as a main compendium about how we think about BPM.
" Prof. Jan Recker, Queensland University of Technology, Australia "The book is written by four renowned BPM experts and is a must-read for all interested in business process management. It is very well organized and easily comprehensible due to its numerous elaborated examples and illustrations. A highly recommended BPM reference book for students, researchers, and practitioners." Prof. Manfred Reichert, University of Ulm, Germany "I have always felt the need for a comprehensive yet simple book on the subject and your book fills this gap quite well." Associate Prof. Priya Seetharaman, Indian Institute of Management Calcutta, India "This is definitely THE reference book for anyone (student, researcher, practitioneer or consultant) in the business process management (''BPM'') field. It is a well-balanced and broad (while still focused) presentation of issues, important for BPM. [.] It is an ideal text-book where the reader moves from chapter to chapter (these are well structured and connected) and also has several exercises to test his knowlege. The book can also serve as a reference to a more experienced professional who can quickly find parts of the book of particular interest to him or her." Assistant Prof. Dr. Peter Trkman, University of Ljubljana, Slovenia "Carlos Drummond de Andrade, a very impressive Brazilian author says that there exist books which are written to avoid empty spaces in bookcases. 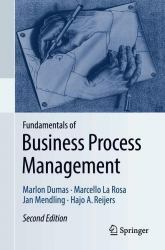 "Fundamentals of Business Process Management" is definitely not the case. It is a very valuable, excellent and suitable book for both educational and professional purpose bringing together history, concepts and practices on business process management. I used the book to guide an academic course on Modeling and Management of Business Processes and the results were very positive. The book presented itself ideally for the course purpose because of its conceptual and practical perspective." Prof. Dr. Lucinéia Heloisa Thom, Universidade Federal do Rio Grande do Sul, Brasil.